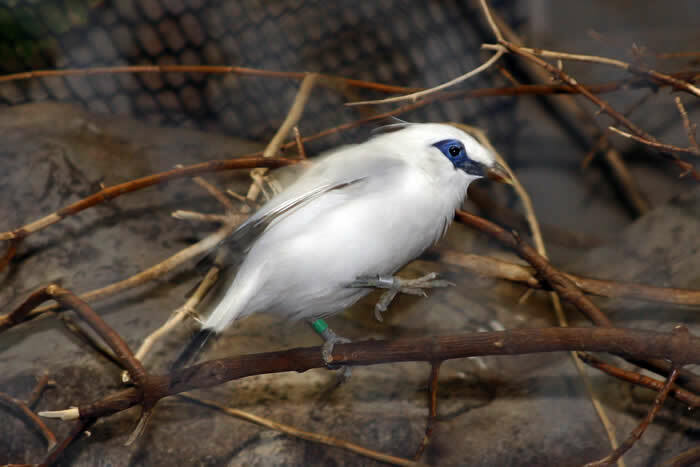 The Bali mynah is one of the most critically endangered species of birds in the world. This striking member of the starling family is pure white, except for the black tips on its wings and tail, and a featherless, sky blue eye patch. Males and females look alike, each with an elegant feather crest on the head. Bali mynahs eat fruit, berries, and seeds. They also eat a variety of insects, especially during the plentiful rainy season. At the zoo, mynahs eat fresh fruit, crickets, and mealworms. Easily seen by predators, mynahs prefer the safety of tree tops near the forest’s edge, only coming down to the ground to drink. Bali Mynahs congregate in flocks of 20-40 individuals except when they pair off to mate. In the wild, nests are often built in old woodpecker holes. Two to four chicks hatch after two weeks. Males and females both sit on eggs and care for young. Currently there are possibly as few as 10 left in the wild in their original range on the island of Bali. They’ve fallen prey to deforestation and poaching for the pet trade. Zoos in North America preserve the species with several dozen in captivity. In 2006, an Indonesian non-governmental agency released birds on Nusa Penida, an island which is 14 kilometers off the south east coast of Bali. Birds quickly migrated to the nearby Nusa Ceningan and Nusa Lembongan. As of 2009, the population on these islands was reported to be in excess of 100 birds. 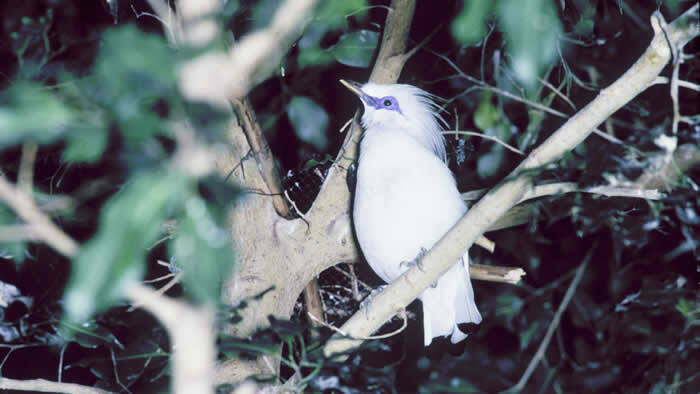 Bali mynahs exist in the wild in only 4 remaining locations: the West Bali National Park and Bali’s small islands of Nusa Penida, Nusa Ceningan and Nusa Lembongan. In the 1980s, scientists estimated about 350 birds in the West Bali National Park. During the 1990s over 400 cage-bred birds were released into the park to increase their numbers. But by 2005, the park authorities estimated the number to have fallen to fewer than 10. This decline was caused primarily by poachers responding to the lucrative demand for rare birds in the caged bird market. The second and much larger population of Bali mynahs now exists on the island of Nusa Penida off the coast of Bali. 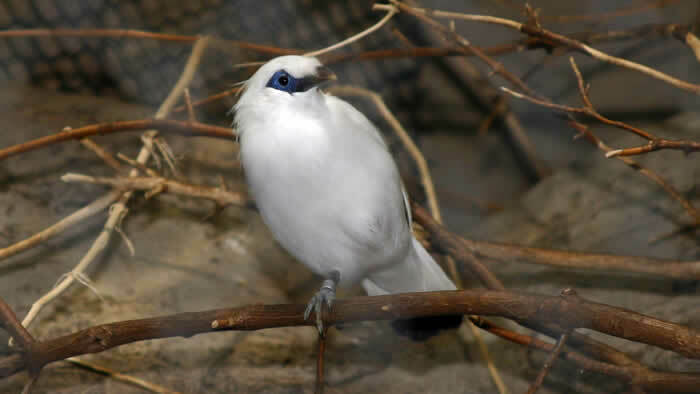 Starting in 2006, the Indonesian group Friends of the National Parks Foundation (FNPF) released 64 cage-bred Bali mynahs on Nusa Penida. FNPF’s monitoring of the released birds state that their numbers had increased to +100 by 2009, and had spread across Penida, with small numbers also breeding on neighboring islands Nusa Ceningan and Nusa Lembongan. The success of the project to create a wild population on Nusa Penida is primarily due to the threat of poachers being removed, combined with a successful breeding, rehabilitation and release program.